Prague is known as the 'Jewel in the Crown' of Central Europe and tourism has played an important role in its economic development in recent years. Read our guide to the highlights of Prague and discover the layout of the city. Prague is the capital of the Czech Republic (Czechia), a country located at the heart of Central Europe, bordered by Austria, Germany, Poland and Slovakia. In the Middle Ages, Prague became the capital of Charles IV's Bohemian Kingdom, with Prague Castle the seat of the empire. And the city has played a pivotal role in the region ever since. Prague's epic history has produced a city full of beauty, of stunning Gothic, Renaissance and Baroque era buildings, and of majestic squares. In modern times, the statist communist era of the mid-20th century has given way to dynamic capitalism. Tourism has helped drive the city's regeneration, transforming grey run-down buildings into bright elegant restaurants, vibrant bars and swish hotels. 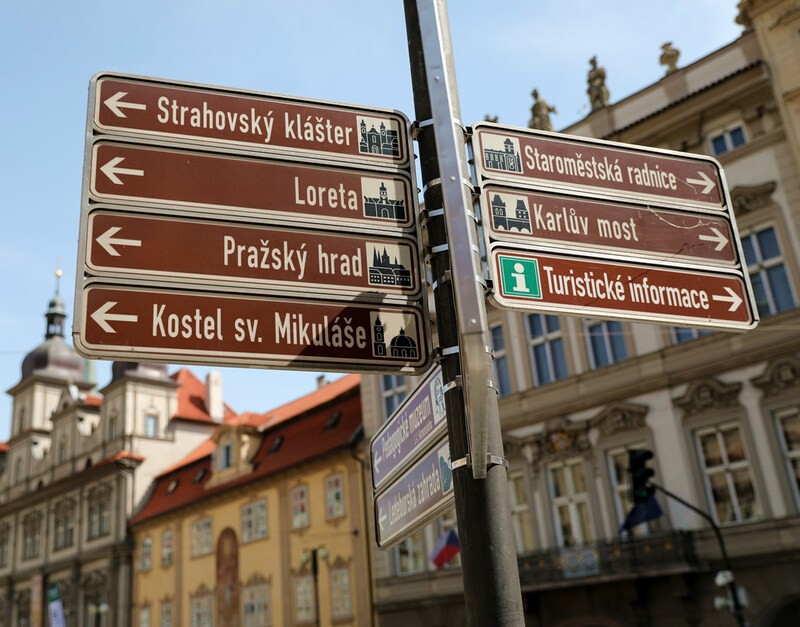 The city centre is compact and the finest areas are mostly pedestrianised, so Prague is best explored on foot; from Wenceslas Square on one side of the city to Prague Castle on the other is just a 30-minute stroll (walking via the Old Town, across the river and through the Lesser Town). The first thing to do in Prague, therefore, is simply to wander through the streets and magnificent squares, to revel in the atmosphere and admire the stunning architecture all around. A sightseeing tour can provide a superb introduction to the city, with a guide to explain the history and significance of the sights. But equally, allow time in your schedule to explore by yourself. Prague is a city to walk around, immerse yourself in, discover places, and to eventually find somewhere nice to stop off for a drink at; all the time letting the worries of the world dissipate. In your travels you will soon come across the Vltava River, which runs through the heart of the city. Walk over Charles Bridge and along the banks of the river to enjoy wide panoramic views across the water. Estates Theatre in Prague A river cruise is the most relaxing way to take in the riverside attractions. There are lunch, afternoon and evening dinner cruises to choose from. You can also admire the river scene from above with a trip up to Prague Castle or by taking a ride on the Funicular Railway up Petrin Hill. With regards to entertainment, opera, ballet and classical concerts are a true highlight. 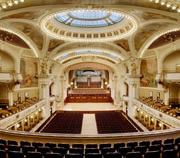 Prague is a city of music, with performances to enjoy all year round in its grand opera houses, magnificent concert halls, ancient churches and other historic buildings. For a typically Czech experience, black light theatre is a unique feature of the city. The shows are fast moving and highly visual, so appeal to all ages and nationalities. Turning to food, the city's restaurants enjoy a reputation for serving good, often excellent cuisine. Pub style restaurants offer hearty food and fast flowing cheap drinks, while at the top end visitors can experience fine dining in beautiful settings, such as by the river or with a view over the city. For refreshments at any time of the day, the world famous Czech beer is deeply embedded in the national physique, and is enthusiastically consumed in pubs and beer halls everywhere; the Czechs are the largest consumers of beer per capita in the world! Old Town Square at Night On sunny days the action moves outside. At one of the many bars and cafés, take a seat on the terrace or in the beer garden, order a cool beer or chilled glass of Moravian wine, and watch the world go by. You will find the time just slips away! For a non-alcoholic treat, join the locals at one of Prague's elegant traditional cafés, where a coffee and cake or a deluxe hot chocolate is the order of the day. 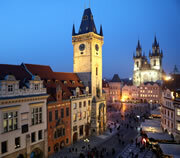 Tourism and an increase in business investment has helped lift the Czech economy, which in turn has led to increased consumerism. The result: shopping has become a national pastime. Prague has its fair share of stores selling the latest international brands, and the largest shopping mall in the city centre is Palladium Shopping Centre. In terms of locally produced goods, aside from Skoda cars the most well-known product is Bohemia Crystal. The finest Czech glassware is sold in a number of shops in Prague. Alternatively, visitors can take a tour to a glass factory, such as to Moser Glass. On one side of the river is: the Old Town (Staré Město), with the Old Town Square at its heart; the New Town (Nové Město), with Wenceslas Square at its heart; and the Jewish Quarter (Josefov). On the other side of the river is the Lesser Town (Malá Strana), and above this is the Castle District (Hradčany), which is dominated by Prague Castle. If you stay in a hotel or apartment anywhere in Prague 1 (or close by in Prague 2), on either side of the river, it is possible to walk around the whole of the city with ease, and to explore all the sights and attractions on foot. Outside the city centre, the areas easily accessible by tram and metro include Vinohrady, Holešovice, Smichov, Karlin and Vysehrad. Prague Castle (Pražský hrad) is the number one tourist attraction in Prague. Set on a hill, it affords visitors to it exceptional views over the whole city. For the ultimate view, climb The Great South Tower at St. Vitus Cathedral at Prague Castle. Other towers to climb include the Petrin Observation Tower, Old Town Hall Tower, Old Town Bridge Tower, Lesser Town Bridge Tower, Powder Tower, the belfry tower at St. Nicholas Church at Lesser Town Square and Jindrisska Tower. To dine with a view, browse restaurants with city views or riverside restaurants. National Theatre = Národní divadlo. 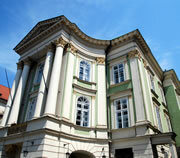 For the full list, see Prague sights & attractions. 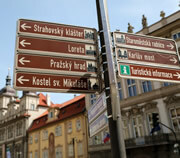 Czech, a consonant-rich Slavic language, is one of the most difficult European languages to learn. Native English speakers can find certain sounds hard to pronounce. Fortunately, tourism and global commerce mean many Czech's speak English, particularly the younger generation, and particularly in Prague. Prague is located in central Bohemia, which is the largest region in the Czech Republic. 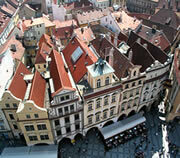 The Czech Republic is located in Central Europe and covers 78,864 square kilometres (30,449 square miles). The country's highest mountain is Snezka (1604m). Its longest river is the Vltava (434km). 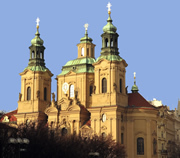 St. Nicholas Church in Prague Czechs belong to the West Slavic group of peoples, along with Poles, Slovaks and Lusatians. Romanies (or Gypsies) form the most conspicuous minority in the country, and are thought to descend from Indian migrants in the 15th century. People from other Central and Eastern European countries, including former Soviet Union states such as Ukraine, have migrated to Prague in recent years to work in tourism and construction. Over 7 million tourists visit Prague every year. Christianity is the country's dominant religion. The Roman Catholic Church is by far the most prominent church, followed by various Protestant denominations, such as the Evangelical and Hussite churches. 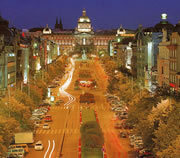 A simple way to arrange your Prague city break is to book the Prague Package. For practical information, including weather and currency exchange, read our Prague tourist information guide.